We offer a wide range of Clamping Devices which include Side Clamps and Hold Down Clamps. The clamping devices cater to variety of applications of clamping work pieces, dies, moulds, jigs and fixtures on machine tables as well as platens. 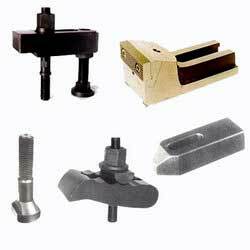 These Clamping Devices are available in various sizes are available. Made out of high grade materials and carefully treated clamps are longer lasting and give optimum gripping pressure.